IT managers continue to feel squeezed by tight budgets and the demand for increased efficiency. Many have begun outsourcing noncore capabilities such as faxing to the cloud. 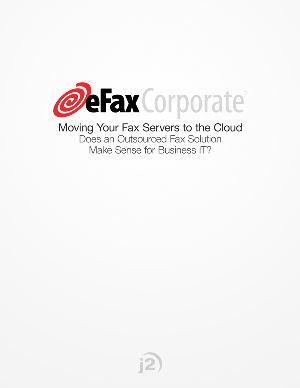 But does cloud-based faxing strike the right balance between reducing the costs associated with running in-house fax servers and improving a company's overall efficiencies? The precedent has been positive. Hosted applications have gained trust and credibility within the business community due to their economies of scale. They carry no up-front, installation, or equipment charges, and offer a level of disaster recovery and redundancy that most companies can't afford to duplicate. But a cheaper solution is not necessarily a better one. Not only are alternative solutions such as FoIP readily available, but additional factors must be considered when evaluating a cloud-based fax solution, including ease of deployment and use, as well as security and reliability. It must also serve customers as efficiently as it serves employees. Nor does every provider of cloud-based solutions offer equal benefits, and IT managers are wise to weigh the pros and cons of all potential providers. Those with a proven track record and a commitment to enterprise-level businesses emerge as best-suited to help a company take advantage of the real advantages known to accrue from outsourcing fax capabilities to the cloud.